In recent years, we have gained solutions for a number of the common concerns of aging. At Foothill Cosmetic in Glendora, we have therapies to help men and women reduce fine lines and wrinkles, improve the tone and texture of their skin, and much more. One problem that has been difficult to solve without cosmetic surgery has been submental fullness - until now. The staff at Foothill Cosmetic is pleased to offer advanced treatment for double-chin using Kybella®. FDA-approved Kybella® is brought to us by Allergan, a name we know and trust in the area of anti-aging solutions. This product has been tested extensively with more than 20 clinical trials and 1,600 patients. Joining the ranks of proven anti-aging injectables, Kybella® has been specifically designed with non-animal and non-human-derived deoxycholic acid. This substance occurs naturally in the body to facilitate the breakdown and absorption of fat. Clinical trials of this product demonstrate significant reduction in subcutaneous fat under the chin after the recommended number of treatments. 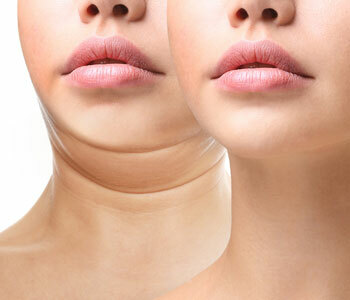 Because Kybella® actually destroys fat cells in the treatment area the risk of a double chin returning is minimal, and typically related to weight and lifestyle habits. Kybella® is a prescribed injectable solution that works to break up accumulated fat cells beneath the chin. Results occur gradually over the course of several weeks. Many patients notice visible improvement to contouring after two to four treatments, though more may be required, depending on the degree of fat accumulation. In a 2015 survey conducted by the American Society of Dermatologic Surgery, it was found that submental fullness is a complaint shared by approximately 67 percent of consumers. This problem may occur for numerous reasons and it is seen in men and women of all ages. Because several factors including age, weight, and genetics can lead to fatty deposits in certain areas of the body, many people find that healthy eating and skin care is not sufficient to resolve submental fullness. The appearance of a double chin can make you appear heavier and older and takes away from the overall harmony of facial features. If submental fullness is a concern that you thought you had to live with, think again. Our team is happy to consult with you about Kybella®. Contact us at (855) 630-5533 today.